In the mood for a dramatic and glamorous look for your next night out? Create your own fake lashes! The whole process takes between five and 10 minutes, and you'll absolutely love how they look. Place a line of adhesive on a plastic dish. The line should be as long as the length of one eyelid -- or a little less. Wait for the glue to become tacky. Take an old powder brush, grab a chunk of bristles from the base and cut them off in a straight line. Spread them in your fingers so that they're even all the way across. Place the bristles on the strip of glue. Press down firmly with a tongue depressor or spatula. Make the lashes as thick as you want by adding more bristles. Continue to cut and press down the hair, until the entire strip of glue is covered. Using your spatula, spread a thin layer of adhesive over the top layer of the bristles. Wait for the latex to dry. Gently pull the eyelashes off of the plastic. Brush black eyeshadow along the bottom edge, to hide any color leftover from the adhesive. Hold the top of the eyelashes and trim off any parts of the glue that are left hanging. You want the bottom of the lashes to be as even as possible. Take clear superglue and place a thin line along the bottom of the lashes to seal them. Hold the bottom half of the lashes. Take the scissors and cut the top half in the design and shape you want, like a diagonal line, or a half moon shape. Think about the length you want as well. 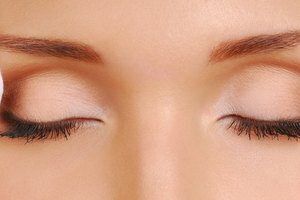 Squeeze the bottom of the eyelashes with tweezers. Curl the lashes with a curling iron, holding for twenty to thirty seconds. Spray the lashes with hairspray before combing through them with an eyelash comb. Then spray again. Alexis Skye has been writing professionally since 2008. During college she interned at "Marie Claire Magazine" and "PCWeek Magazine." After college she worked for Restaurant.com writing bios for the restaurants in her area. She graduated college with a Bachelor of Arts in English and is pursuing her Master of Fine Arts in writing. 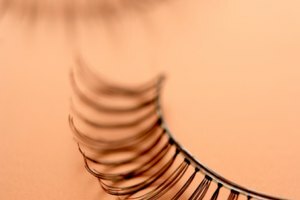 What Can I Use to Glue Eyelashes?